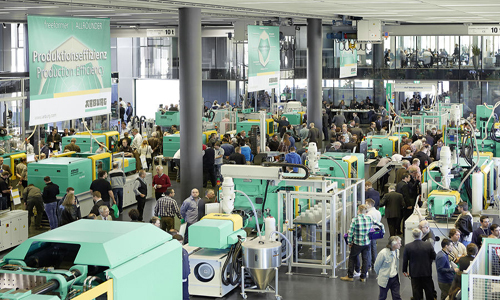 More than 5,900 invited guests attended the Arburg Technology Days 2015 event from March 11-14. The focus was on production-efficient processing technology, from one-off parts to high-volume production. This year, around 45% of visitors came from abroad. The largest groups came from Europe: Switzerland with around 280, France with around 210, the Czech Republic with around 160 and Poland with around 130 participants. Significant groups came from overseas, particularly from the US (around 140 guests) and China (around 100). “Once again this year we have put together a very interesting range of technologies and services for our international guests, presenting our innovative and production-efficient solutions and offering an insight into the future of efficient plastic parts production,” said Michael Hehl, Managing Partner and spokesperson for the Arburg Management Team. The individualization of mass-produced parts using the Freeformer was demonstrated in the Efficiency Arena. A pair of office scissors was used as an example to demonstrate the combination of injection molding and additive manufacturing, making use of Industry 4.0 technologies. Several different versions of scissor blanks were available for visitors to choose from. An Allrounder molded the handles onto the scissors, after which a code was applied by laser to ensure unique traceability and to display all the relevant process data. At the Freeformer station, individually configurable 3D lettering in PP was additively applied to the scissors. In the Freeformer Technology Centre, Arburg used a total of five Freeformers to present the current progress in the development of Arburg Plastic Freeforming (AKF). One Freeformer demonstrated how new functional samples of scissor handles could be produced in a short time and how the parts could be optimally designed for additive manufacturing. Another system produced a scissor holder in an additive manufacturing process, as an alternative to conventional fixture construction. For example, bellows made from thermoplastic polyurethane (TPU) and key chains made from acrylonitrile butadiene styrene (ABS) with an articulated joint were produced in the Freeformer Technology Centre and the second discharge unit was used to process a special supporting material that can be easily removed in a water bath at a later stage. Demonstrating the production of micro components, a special micro production cell is built around an electric Allrounder 270 A operated with the new Euromap size 5 micro-injection unit. Together with a linear Multilift H 3+1 robotic system, this formed a flexible system solution for the reproducible production of micro components, in this case micro counter wheels weighing just 0.004g. Several systems were used to demonstrate lightweight construction technology. In collaboration with the Institute for Plastics Processing (IKV) from Aachen, Arburg has developed the Profoam process, in which the plastic granulate is mixed with liquid propellant in a granulate lock upstream of the injection unit. An electric Allrounder 820 A was used to produce strong, lightweight, low-distortion parts with a homogeneous foam structure based on the example of a physically foamed airbag housing made from fiber-reinforced polypropylene. Meanwhile, the production of high strength lightweight parts using long fiber direct injection molding was demonstrated by a hydraulic Allrounder 820 S. It produced a high-strength pedal for the automotive industry. Lightweight parts made from particle foam were produced on a hydraulic Allrounder 470 S and additional functions were integrated by injecting thermoplastic material. For the medical sector, Arburg presented a stainless steel version of an electric Allrounder 370 A, which was used in a class 7 clean room to produce ampoule holders on a four-cavity mold. Particle contamination in the production environment was also measured and analyzed as part of the exhibit. Further exhibits include an electric Allrounder 470 A that was specially configured for processing LSR in a clean environment, as well as an electric Allrounder 470 E with complex eight-cavity mold, equipped with a hot runner system and a lateral needle-type shut-off nozzle. In the packaging area, thin-walled items, screw caps, flip-top and multi-component closures were examples of the demonstration.